I took part in the most recent kickstarter number 3 from Troublemaker Games, and they arrived today - yay! These new models are available, or will be available shortly, from the Skinnerz shop at Steel Crown or from Troublemaker Games. 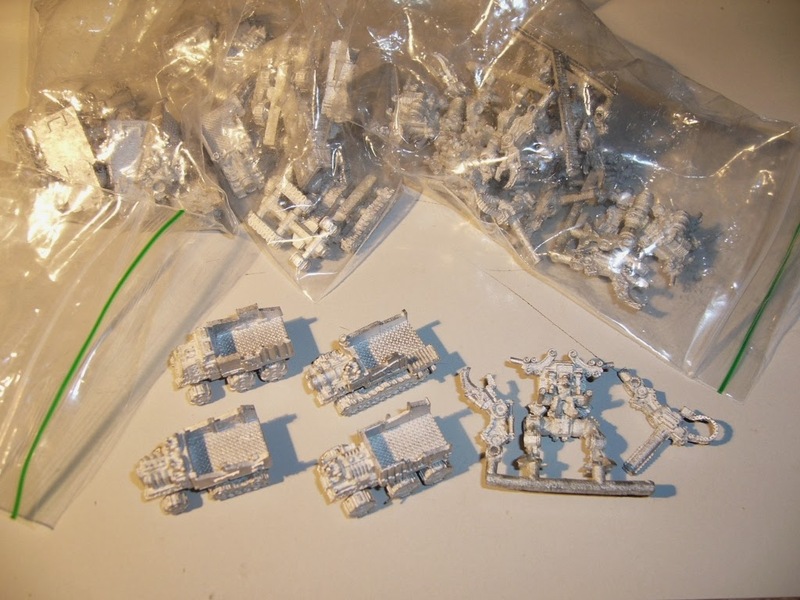 Made by Ben Skinner from the UK, these are now the best and growing range if you're wanting an Ork Epic army these days... or as they might say "We're da Skinnerz made by Skinner!" They are superior to the old Specialist Games models in my opinion. I got a bunch of the Modular Flatbeds (Truks!) and some of the awesome Tramplers. Flatbeds come with 4 top halves and 4 bottom halves so you can make up to 16 different combinations. Pics to follow once I get them assembled and painted! I also have some of the Beast Super Heavy Transports, Flame Vectors and Droghur Shuttles from the two earlier kickstarters. 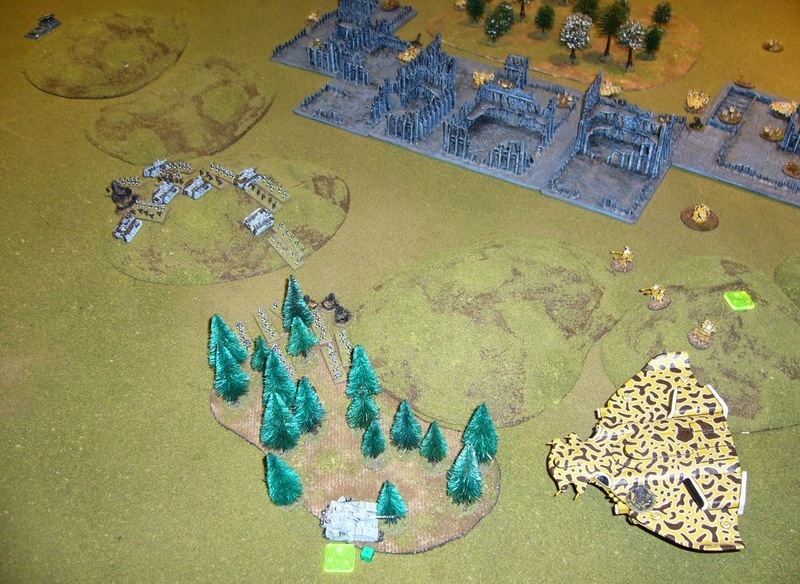 My Imperial Guard Steel Legion force went up against Andrew's Vior'la Tau the other night. 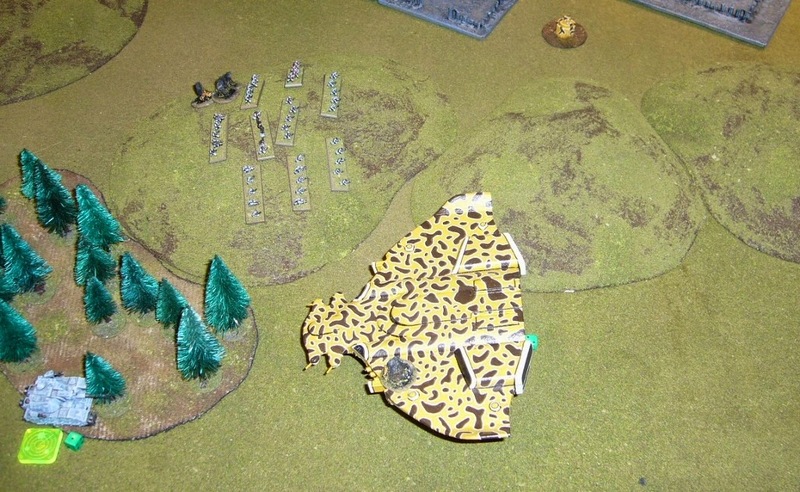 The Tau fielded two giant Mantas! Meanwhile I was fielding nine super heavy tanks. Who would prevail - read on! 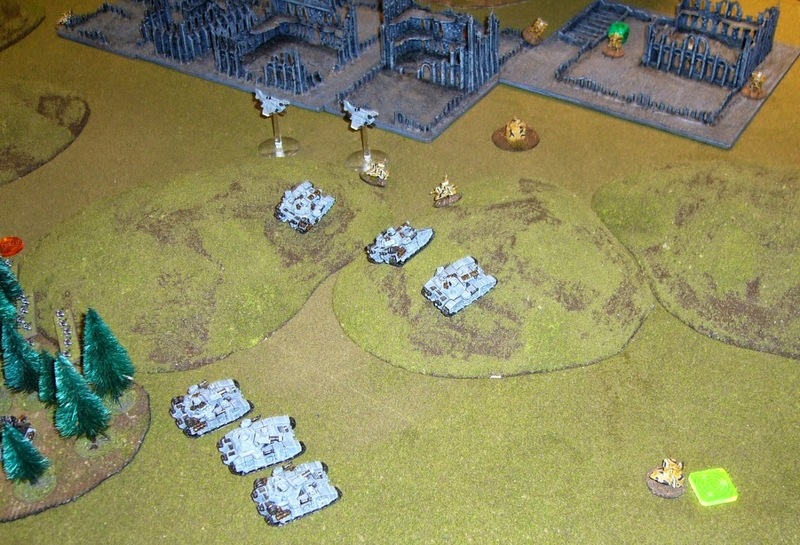 My Steel Legion list was the following, lots of super heavy tanks with artillery and four companies of infantry in support. 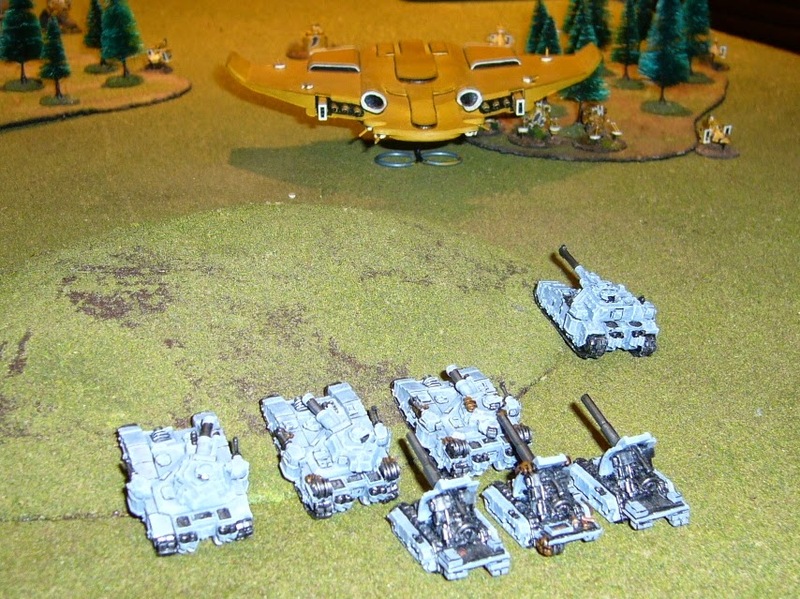 Andrew's Tau list included two Manta Gunships. These are huge units capable of transporting other formations, and of resisting and dishing out fearful destruction. Amazingly Andrew had made these models out of wood in a laser cutting machine! 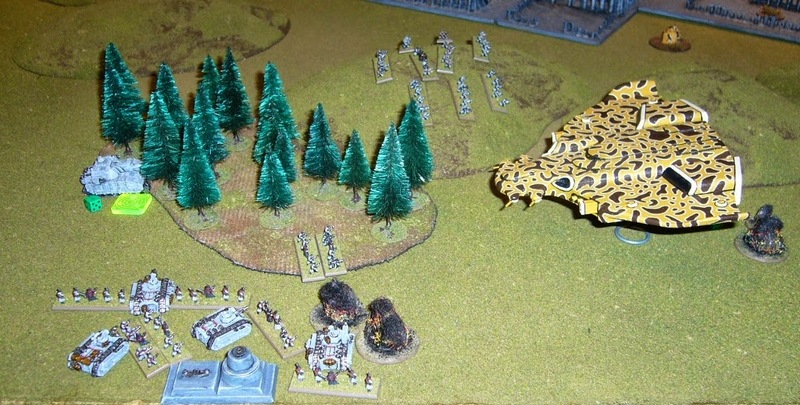 Only one had it's camouflage painting finished at the time of the game. Here's the battlefield setup. 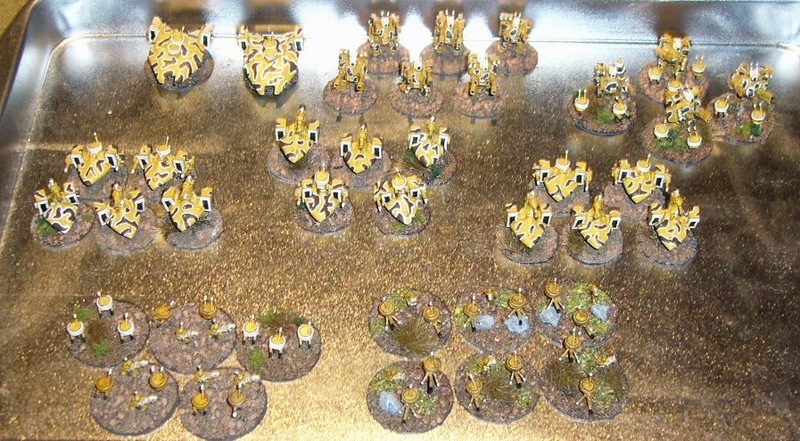 Given the lack of blast area weapons available to the Tau, many of my formations cluster close together behind cover. 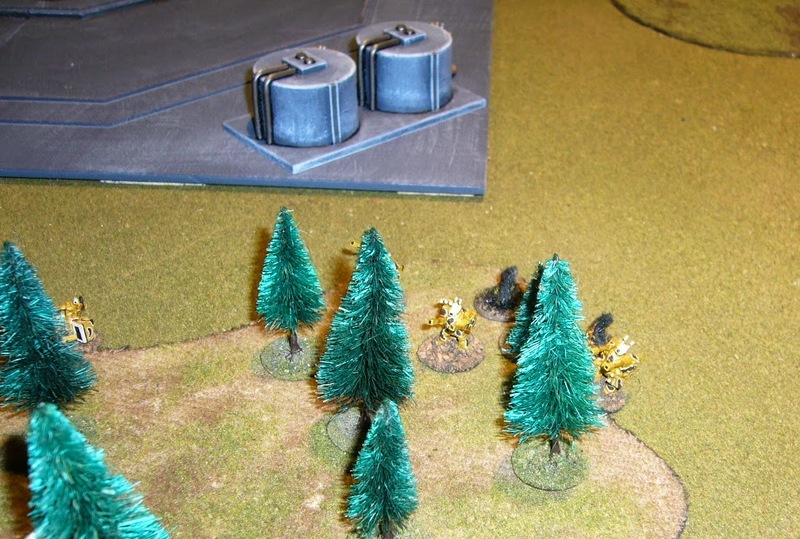 Two infantry companies are deployed forward of the Imperial line in forests. 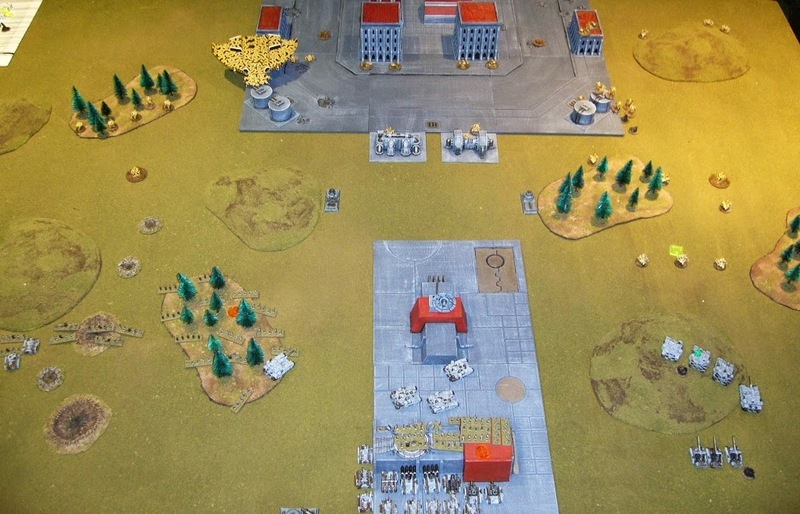 A photo showing the setup from the Tau perspective. The other Manta then retains initiative, advancing and blasting a Shadowsword, heavily damaging it (2 damage), and breaking it. 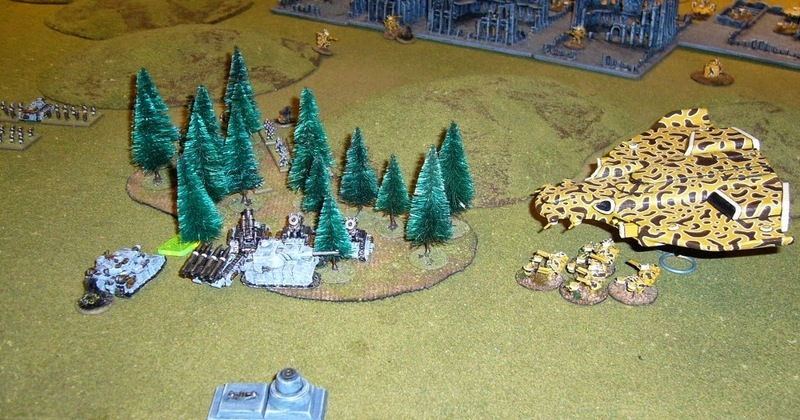 Broadsides finish off this Shadowsword later in the turn before it can recover. Only two Shadowswords left and they are my main defence against the Mantas! 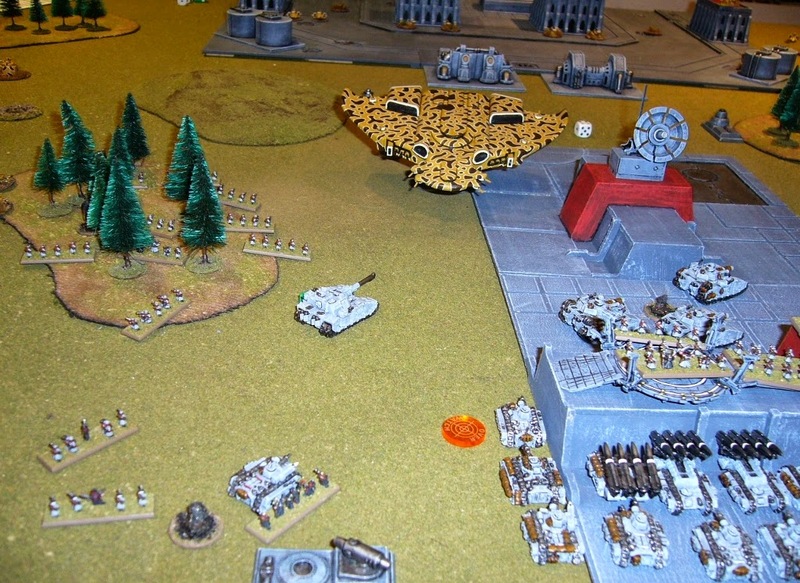 My activation, and a Shadowsword rumbles forward and lines up the Manta. Boom! One damage which is also a critical hit knocking out the deflector shield for the rest of the game! 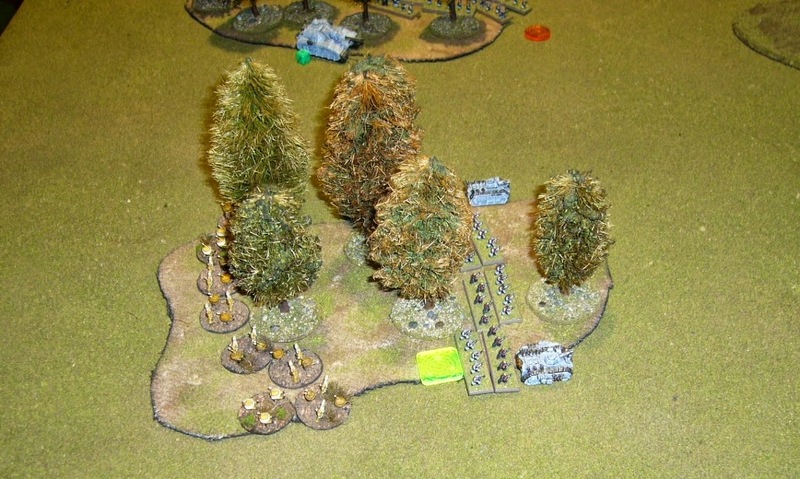 See what happens when you don't paint the camouflage in time for the game Andrew? 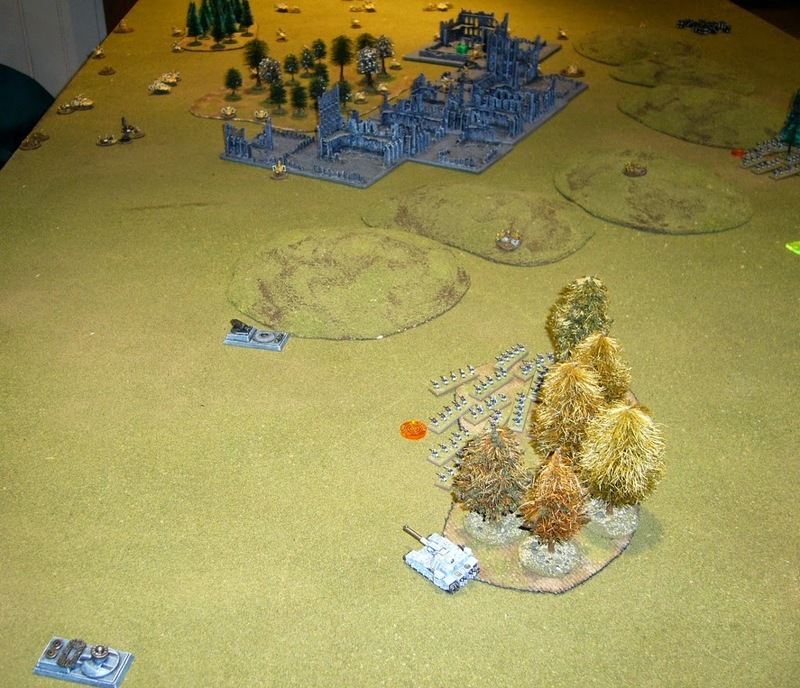 I retain initiative with the other Shadowsword, driving into the wood ahead to seek some cover and passing the dangerous terrain check. This Shadowsword opens fire and inflicts another 3 points of damage on the Manta (they have 8 damage capacity total - same as a Warlord Titan!). 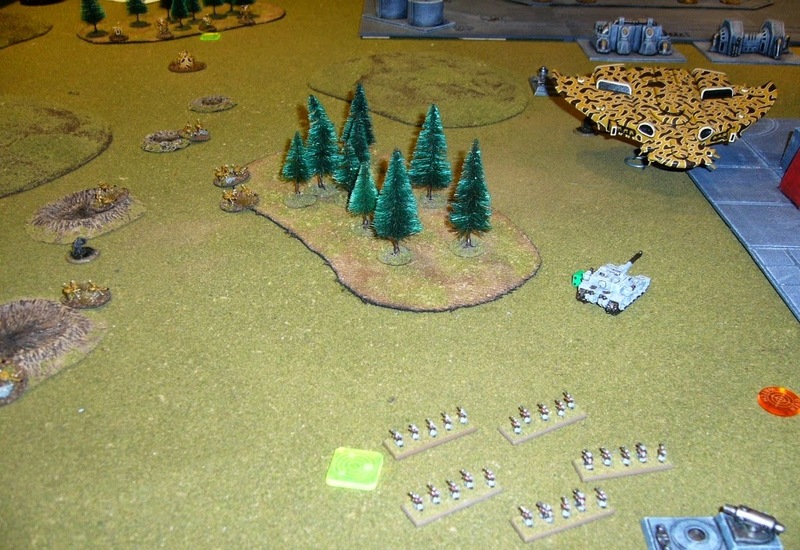 More fire is exchanged including a Bombard barrage upon the Manta and Broadsides which finally breaks the Manta. Undaunted the Manta uses its break move to advance even closer, unloading Crisis suits into the woods. Tau recon units attempt to take out my Basilisks, but despite two rounds of shooting and four hits on them they all survive! I decide to concentrate all my fire on the broken Manta, including most of my artillery and all my Baneblades.I can't afford to let it rally and deliver another round of fire! Success - the Manta crashes into destruction! 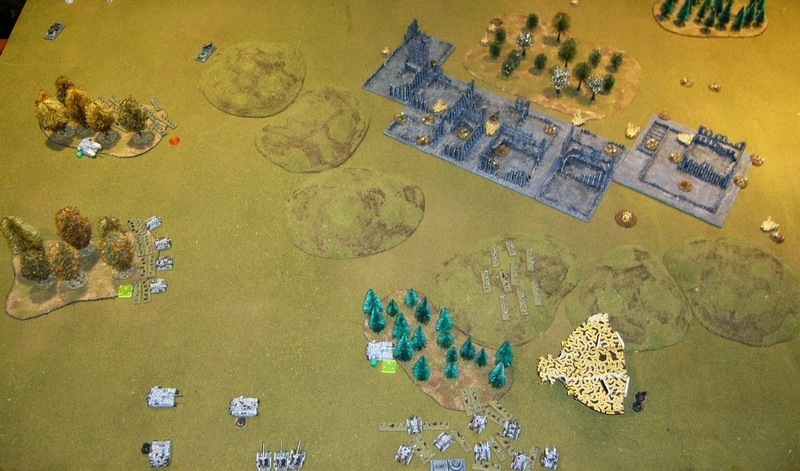 End of Turn 1, showing overall positions. 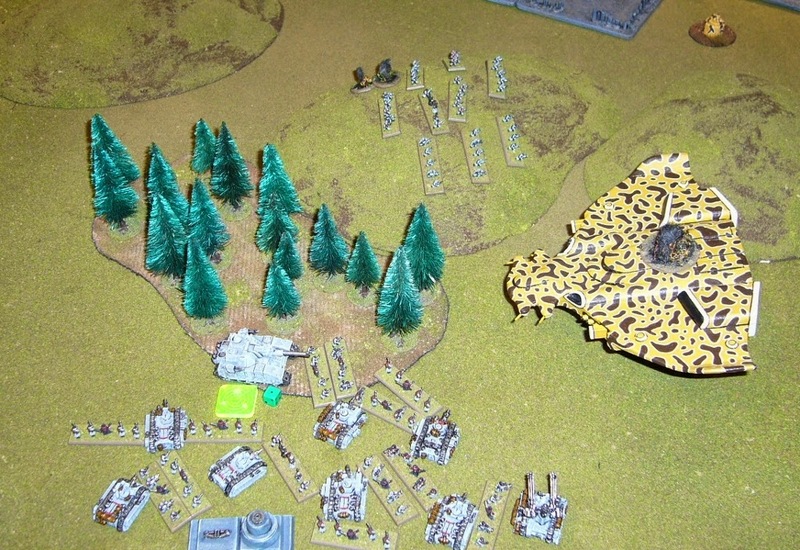 I've lost an Infantry Company and a Shadowsword, but one of the fearsome Mantas is destroyed. Not a bad turn for the Guard and I'm feeling slightly confident. 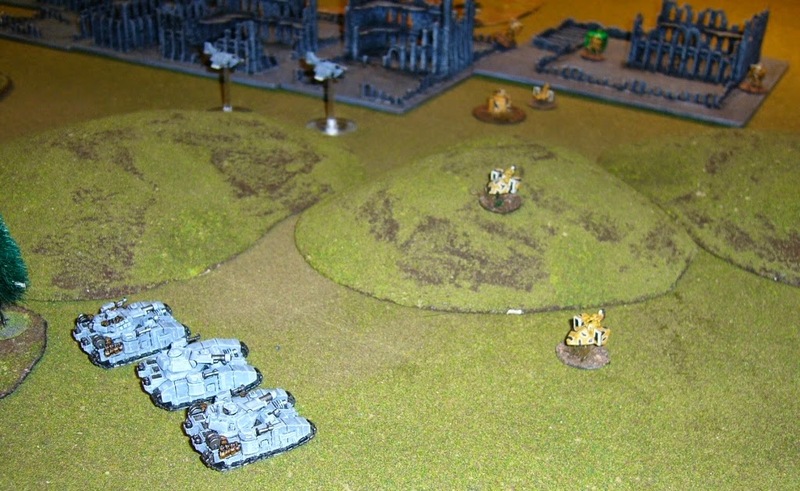 My Supreme Commanders Formation has advanced a move still hugging the craters on my left flank. 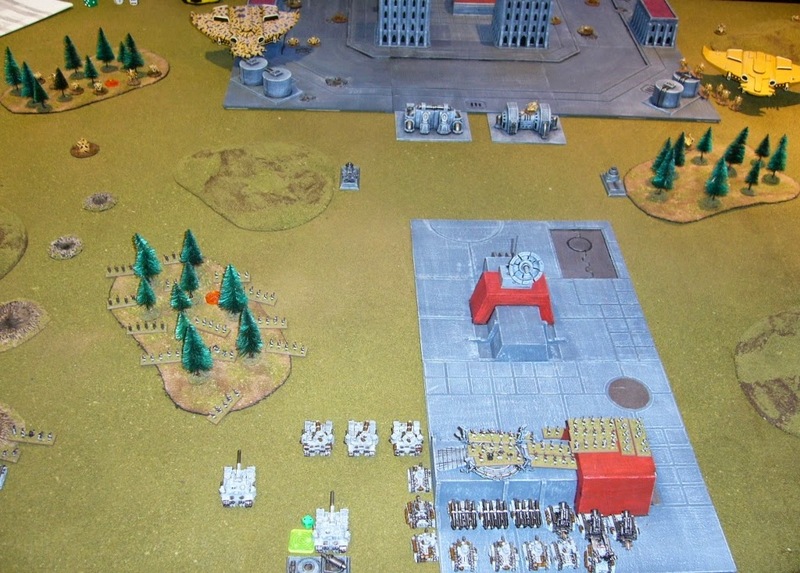 Tau Stealth Suits appear behind my Supreme Commanders formation, and Tau win the Strategy Roll again. 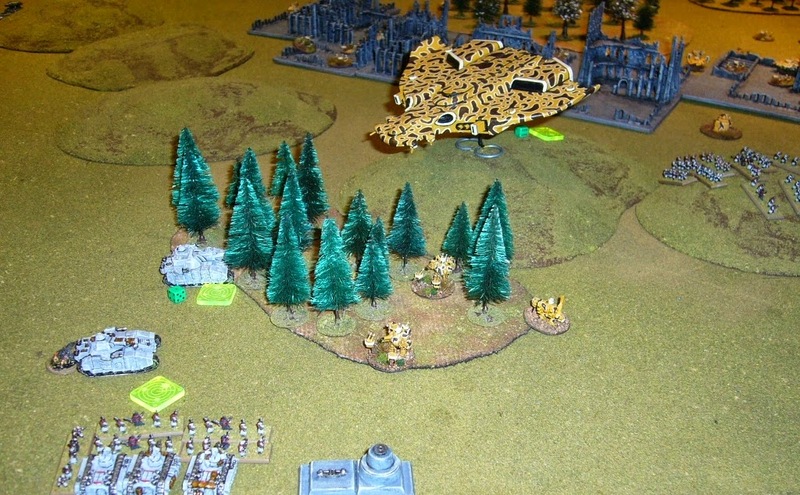 The Manta advances catching my formation in a deadly crossfire with help from Stealth Suits and then the Broadsides. My devastated Supreme Commanders formation falls back to my Blitz. My own formations fire back reasonably ineffectively, though they do break some Tau recon formtions. Both my remaining Shadow Swords are damaged and broken. End of the turn and both Shadowswords and the Supreme Commanders formation have rallied. 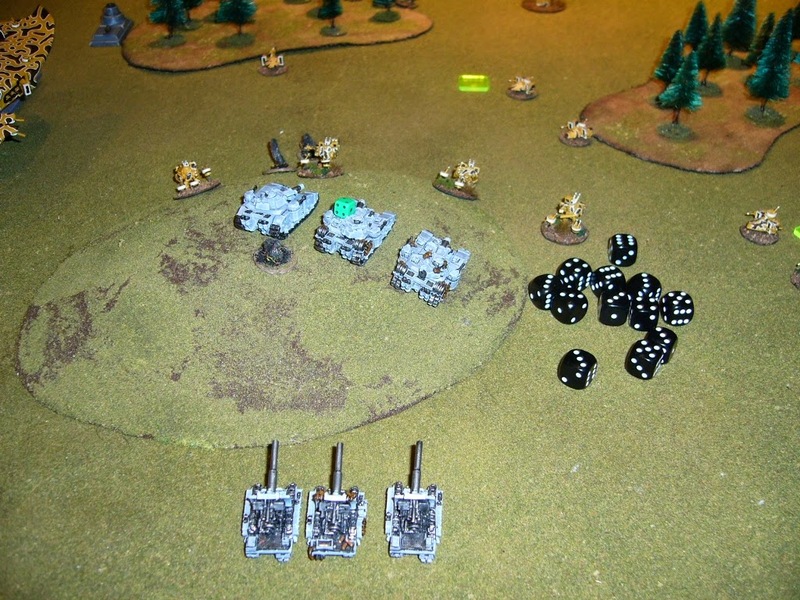 My Thunderbolts finish off a Tau recon formation. Other shooting is less effective. 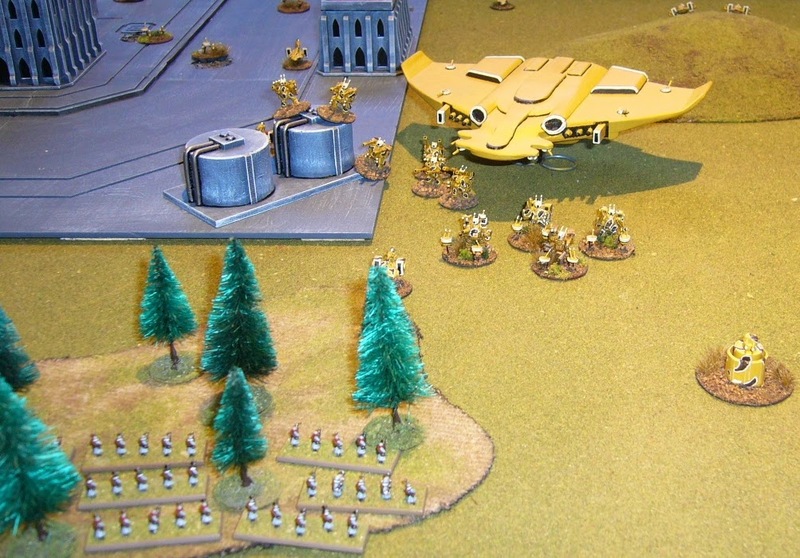 Tau win Strategy Roll again, and the Manta advances ominously, lining up the Supreme Commanders formation. 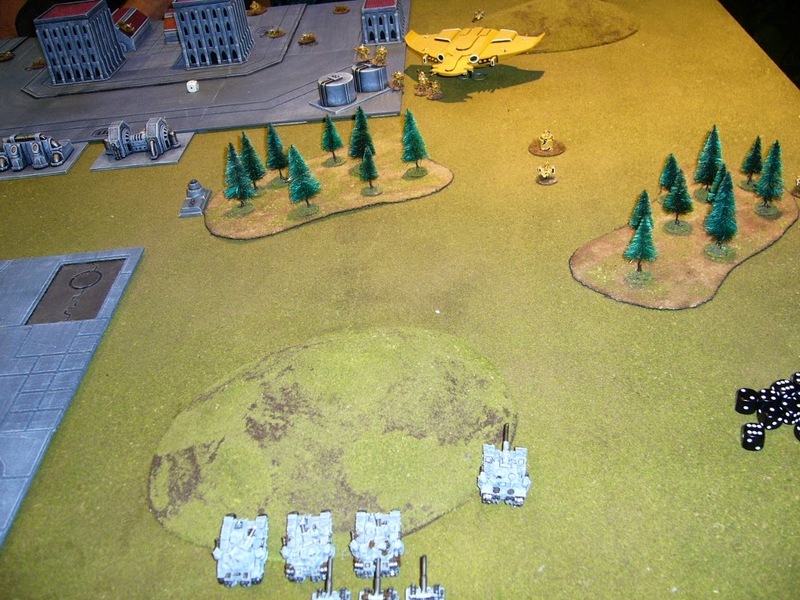 Only one unit survives the barrage, fleeing only to be shot down by more Tau Recon units. 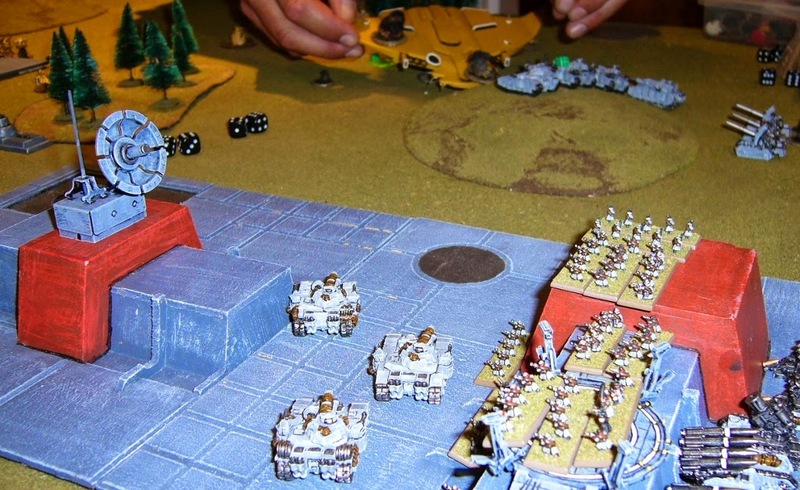 My Shadowsword lines up the Manta but must have panicked at how close it is, rolling a 1 and missing. 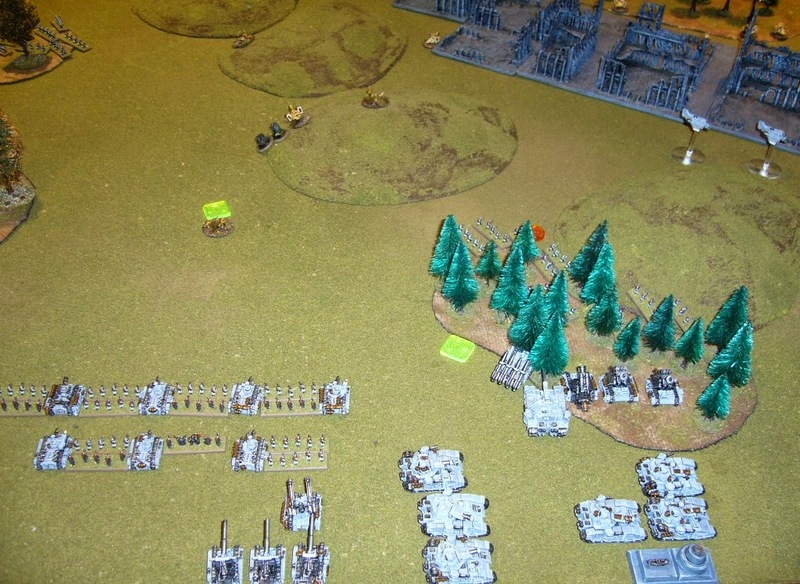 My artillery hits the Tau broadside formation on my right flank. 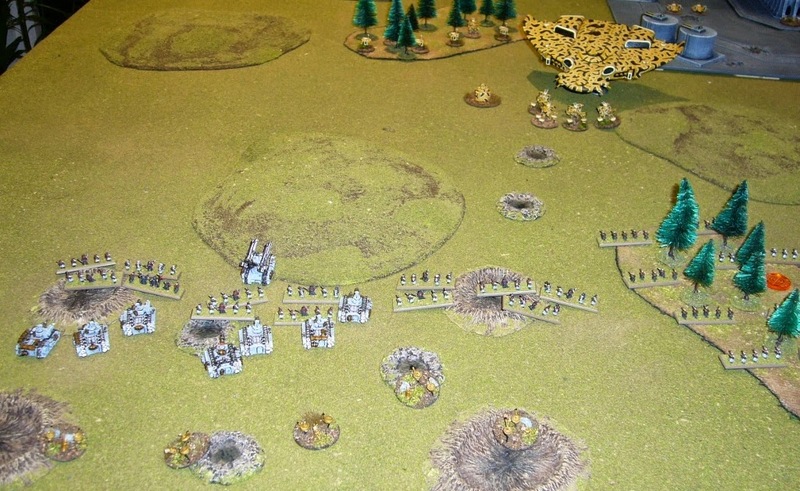 They have been taking artillery rounds each turn and are now down to half strength, though still not broken. 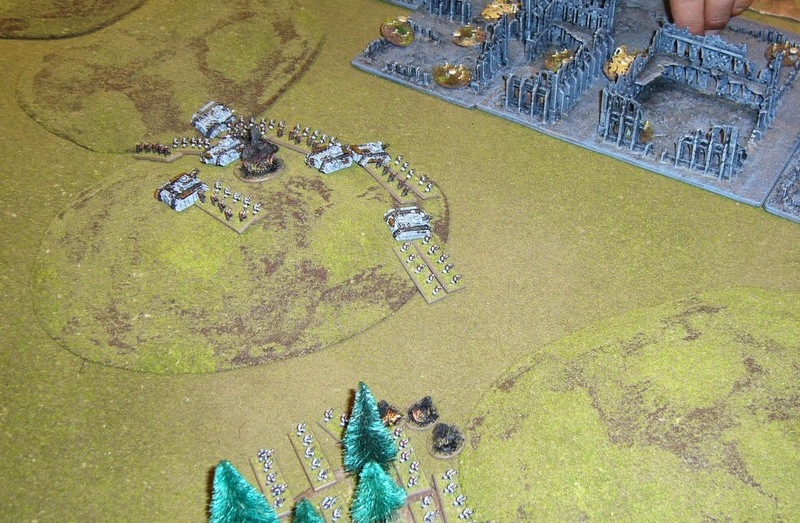 I'm trying to clear a path through here for my Baneblades to get to the halfway line and the objectives. However the Manta sweeps over to my right flank as its retreat move and Crisis Suits deploy here. Too late I realise what is happening. 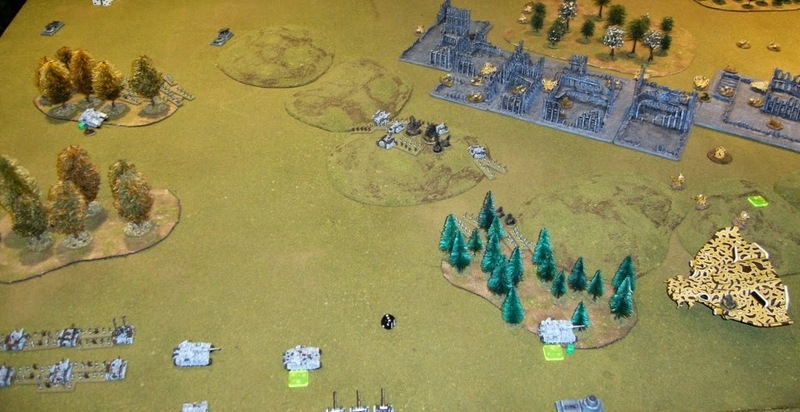 Recon and Crisis suits are blocking my advance with my other Baneblade company, so I am trapped in my half of the table unable to get the Baneblades into enemy territory or to contest the objectives that the Tau now hold! 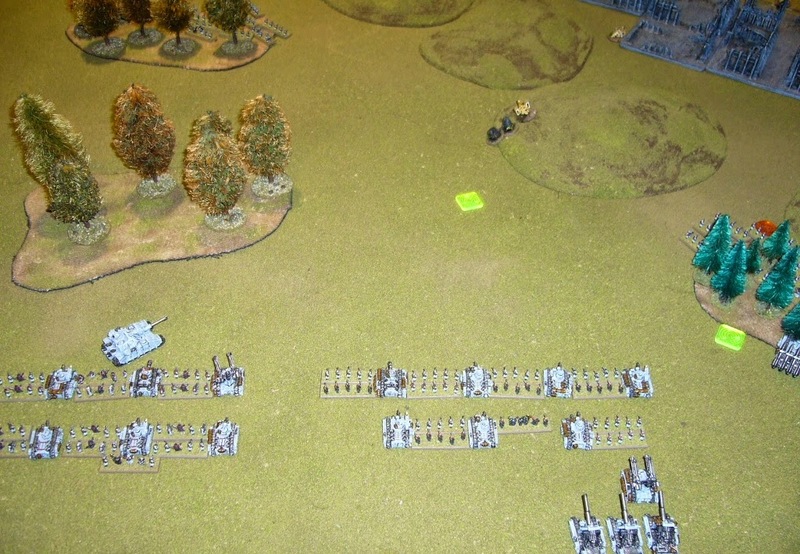 My Thunderbolts fail their activation roll. Out of frustration the Baneblades sustain fire upon the Crisis Suits in front of them. I inflict 12 hits, but the Crisis suits save them all! 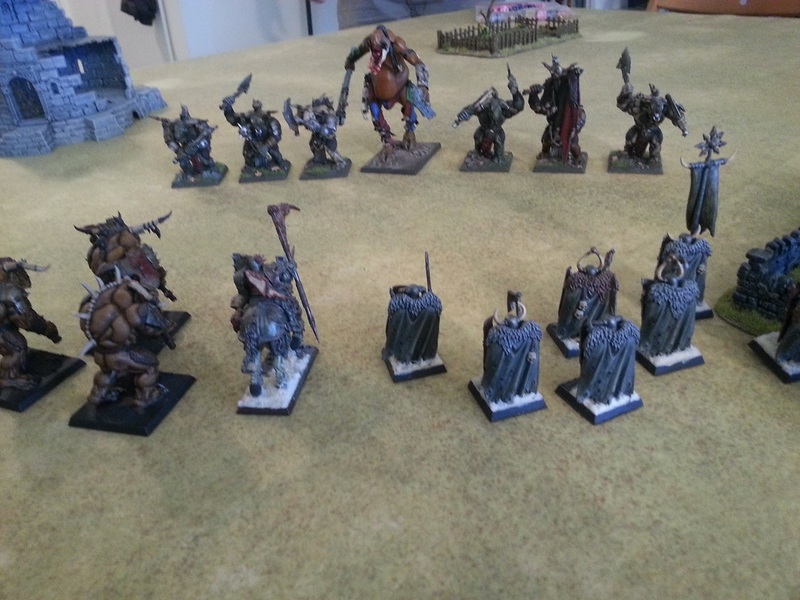 End of Turn 3. 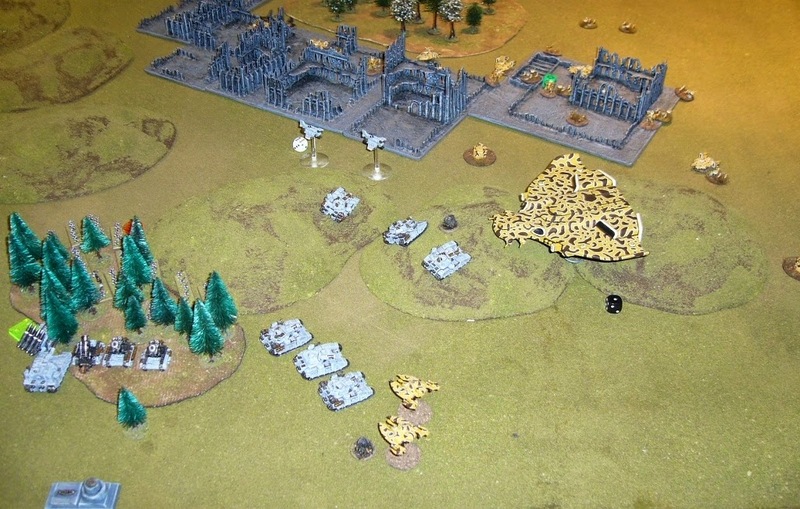 With the failure to secure ground or objectives and loss of their largest formation, the demoralised Guard army breaks and the battle is over. 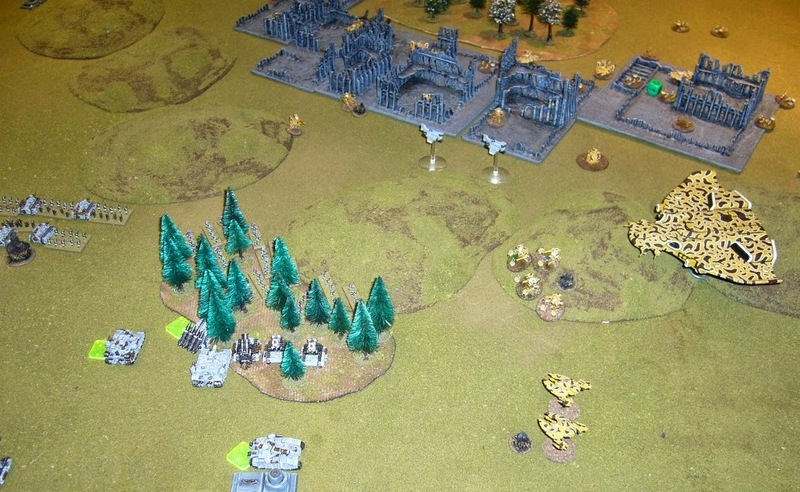 Tau have won 3-0 with 'Break Their Spirit', 'Take and Hold', and 'They Shall Not Pass' objectives! 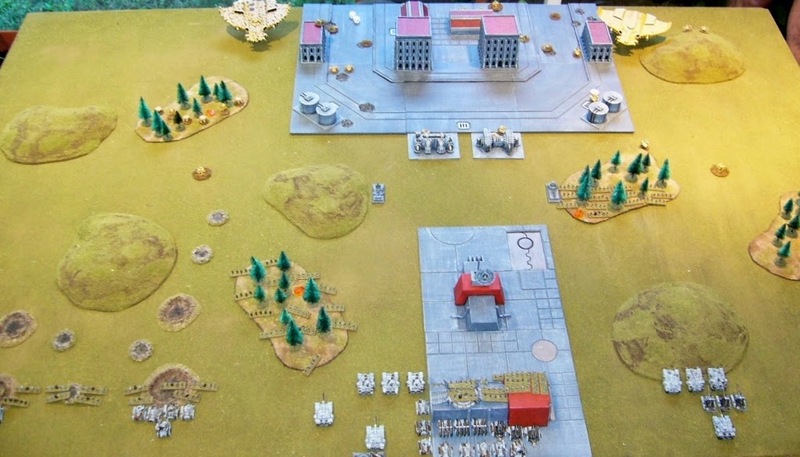 A fun game, where I underestimated the flexibility of the Tau approach, and was so focused upon the Mantas that I neglected my positioning and was unable to contest the objectives or ground at the end of Turn 3. By the time I had realised that I was in trouble it was too late! 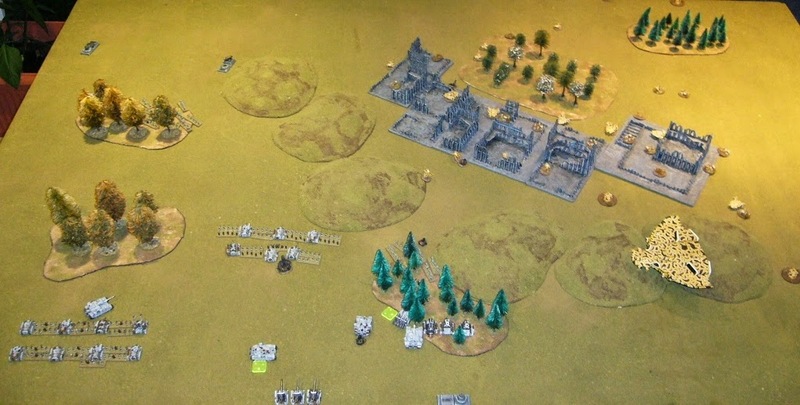 I should have driven some Baneblades forward earlier to contest the half way line and objectives, but the first action of the game where my Infantry Company was annihilated induced had made me too hesitant about advancing. I was also too cautious and failed to attempt to retain initiative when I should have done so several times. 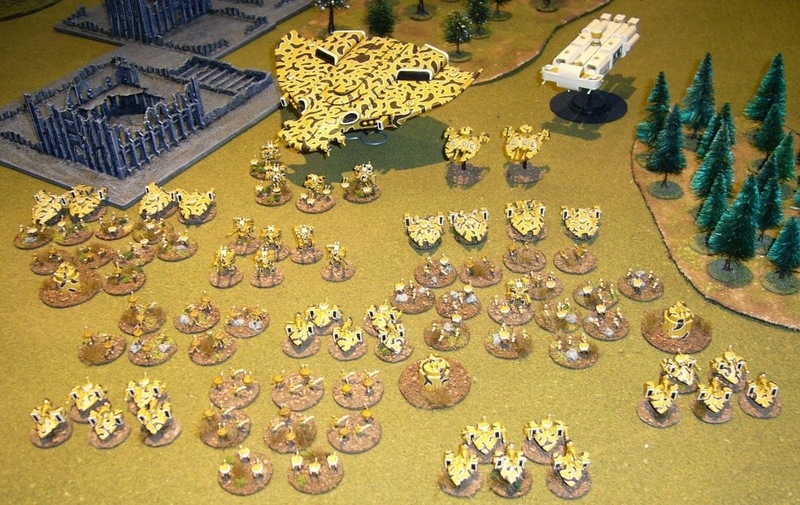 My Supreme Commander was also a "Break Their Spirit" objective which generally isn't done, and probably I should have spread my eggs across more baskets in this regard, shifting this formations Hydra to a Baneblade formation perhaps. This last point was a minor detail compared to the other mistakes though. Anyway, well done Andrew! Shas’o Sav’lynu [lit. Commander, Steadfast in the Future], newly promoted and recently returned from the Bork’an Shas’retha [Fire Caste military academy], drew the assembly to order. Decided to help with a play test of the Vior’la Tau List. Mark kindly agreed to keep his Baneblades as their standard version for an approved list. The Vior’la list let me augment a Fire Warrior Cadre with enough points to make if sufficiently expensive to qualify as the BTS formation in a list with Mantas. Taking two Mantas, now possible at 4000 pts due to the price drop to 650 pts, without either of them being the BTS. Making a much more aggressive use of the machines possible without risking an objective. Only had one Fire Warrior formation, fully tooled up as a BTS, and deployed as a Blitz guard to keep it (BTS and Blitz) safe. Including an Ethereal made the formation Fearless and Inspired. To protect him I planned a shell game with Devilfish. As it turned out I probably should have pushed this formation forward somewhat. 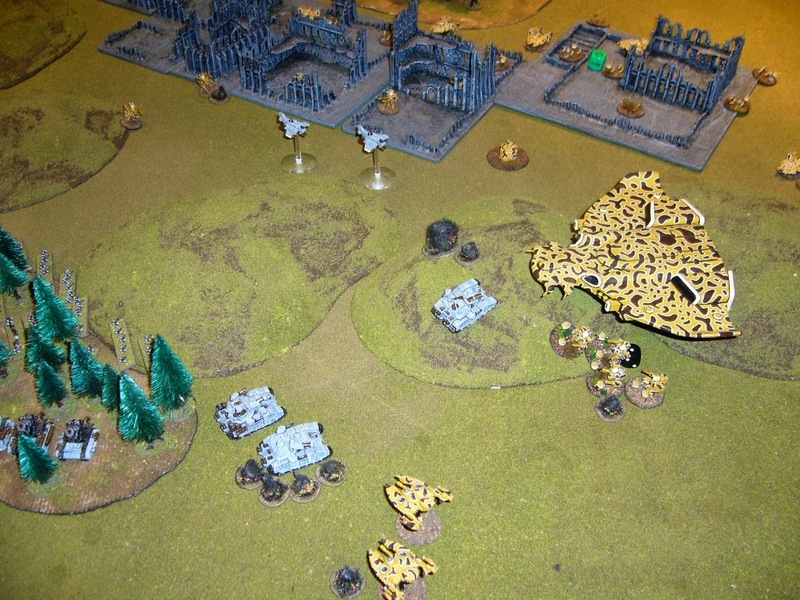 The Pathfinders were there to allow them to spread out to mitigate the effects of heavy artillery templates. The Vior’la list has no limit on the number of upgrades you can take (standard Tau restrict to three) but you can only take each one once. Different flavour but not too extreme since the list of upgrades is not soo long. Using the Tau Jet Pack rule to re-board the Manta (transport) after getting out to fire was something I’ve wanted to do for a while. Keeping the Crisis Suits in contact with the Manta also gave them cover (I assumed). 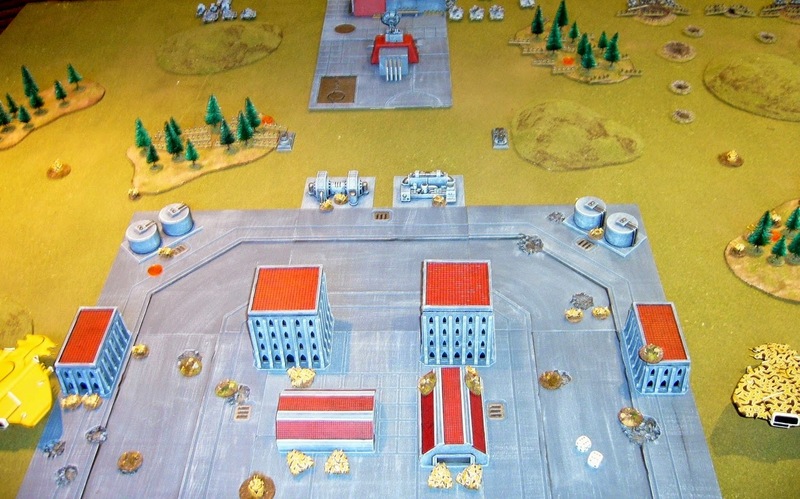 It gave the small Crisis Suits significant protection from the enemy artillery; my suits are frequently broken with BMs or ridiculously expensive. The move with Manta and then disembark and shoot also gave an extra 5 cm to the engagement range making it more likely I’d benefit from the Fusion Blasters (15 cm, MW4+). Integrated use with the Manta also secured Markerlights in this engagement envelope. Ultimately the ability to dismount if the Manta broke or was engaged and still retain the passenger’s activation was an additional enducement. Not certain about the smaller sized Tetra/Piranha formations. Don’t mind them, they seem a little more efficient (points cost, model purchase, mix of Tetras and Piranhas) but unsurprisingly have rather fewer models once broken and are then less efficient at the blocking (broken double to tie up enemy lines of advance) role they then adopt. Shock and Awe, hmmmm. Actually my increasing impression with Tau is that you are loaded for bear but frequently don’t get into a position unleash the firestorm. 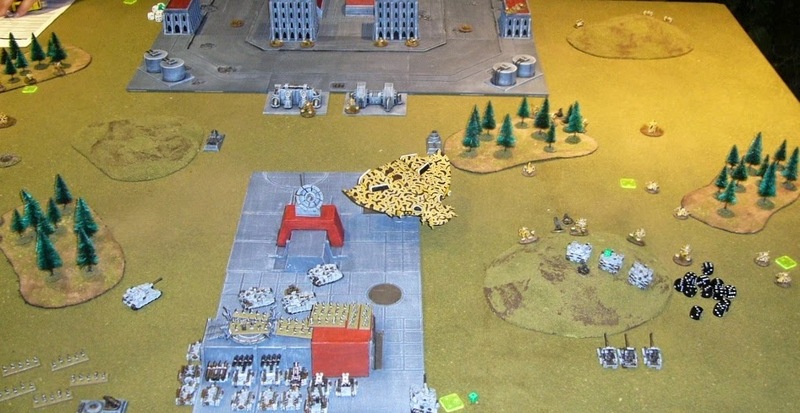 A key part of securing success with Tau seems to setting up the shots and being able to cope with the string of ineffectual pin-pricks that is your more common lot. And not over exposing more powerful formations in your haste to secure the Mont’ka. 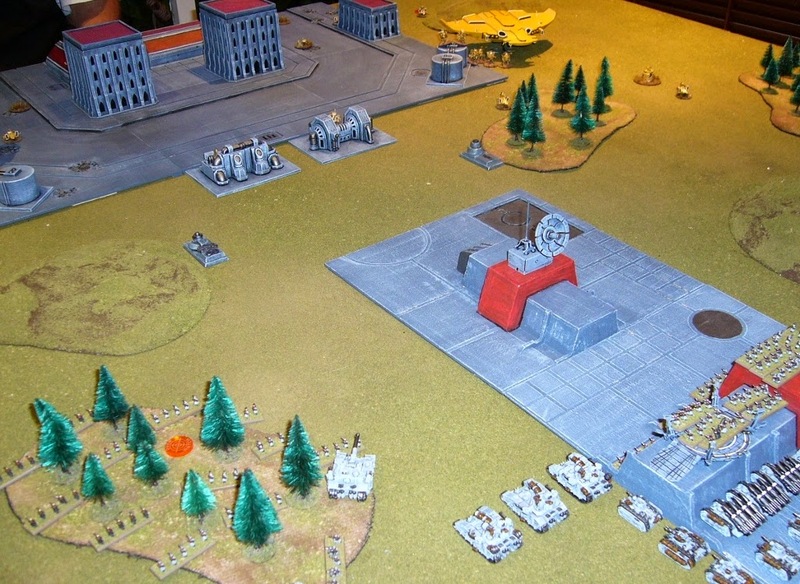 OK, I’d planned to try an alpha strike to hit the Guard Artillery park. But realized after rolling for the activation that the Imperial Companies on Overwatch would shred my (5 strong) Tetra Pathfinder and probably break the formation before Markerlighting the enemy. As it turned out a loaded Manta, activating on Init 1+, with integral Markerlights and carrying a couple of high firepower formations IS EFFECTIVELY a coordinated fire mission anyway!! Live and Learn. 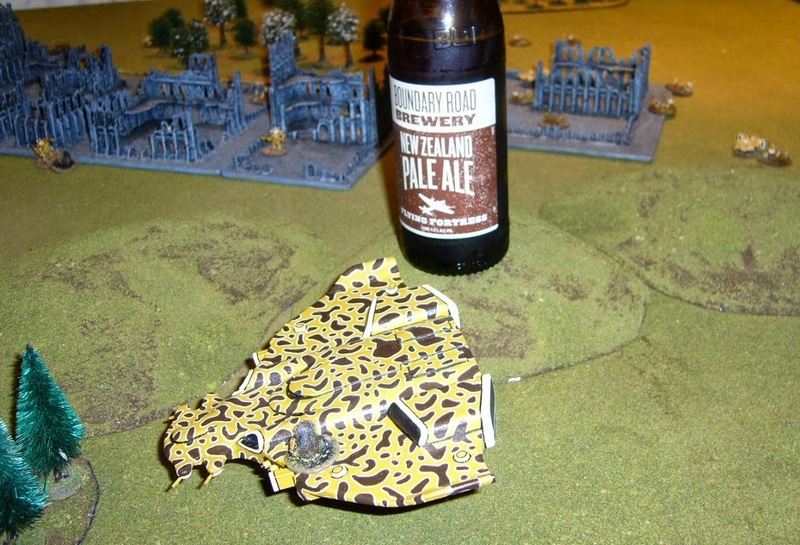 OK, wargamer’s superstition. The Manta I first built has not yet had a camo pattern painted on it (took hours on model two). In both the games this bird/fish has now participated in the first DC of damage inflicted on the Warengine has caused a critical hit, loss of the Tau Deflector Shield. Next lot of incoming fire also caused 5 DC on the next significant enemy activation!! A little more time with the paint brush will doubtless improve its luck. 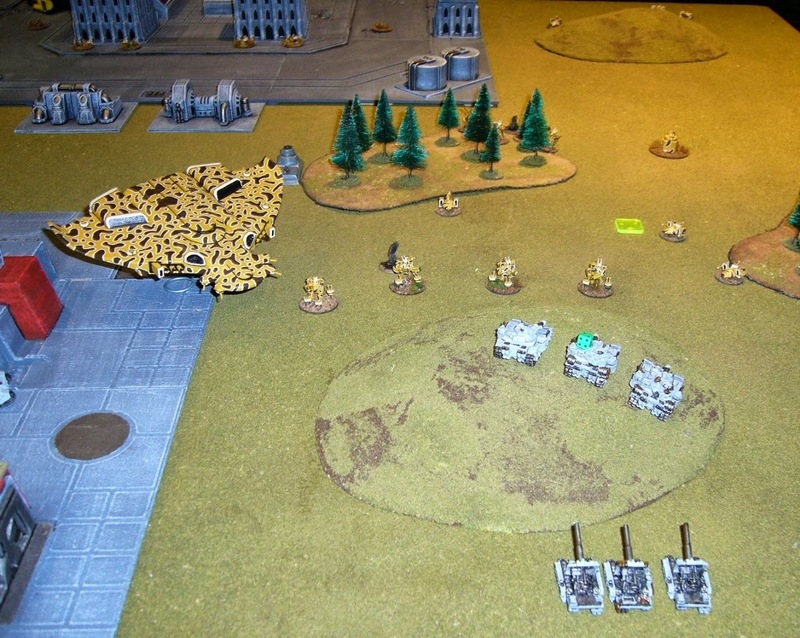 My Broadsides have been rather more heavily targeted in the last couple of games. This has led to them being broken (vs Guard) or wiped out (vs Black Templars). 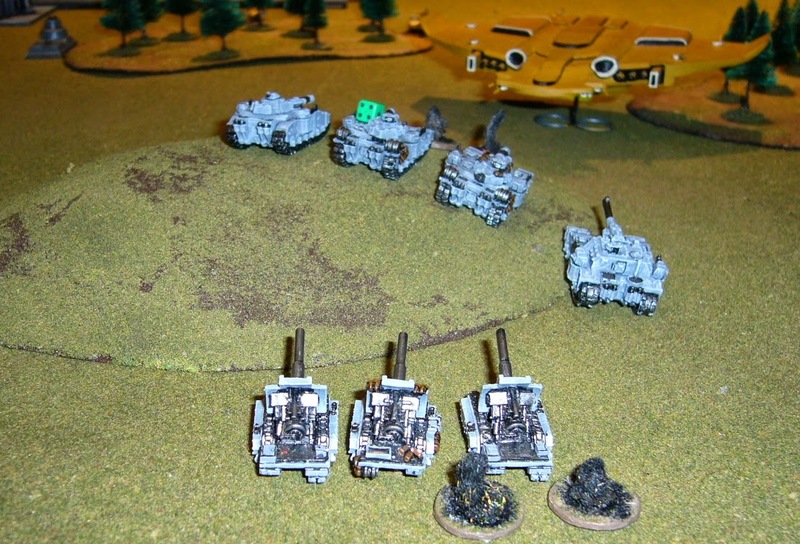 Imbedding Broadsides in the Fire Warrior Cadre (with the Standard Tau List) was one option. The different flavour of Vior’la will doubtless see me returning to attaching extra Gun Drones. I’d promised myself I’d not use the Stealth Suits so aggressively “next time”. As it was the chance to target the Guard BTS was too tempting. My usual planning is to have several Stealth Suit formations so using them aggressively is more plausible. But a lack of points in this build. 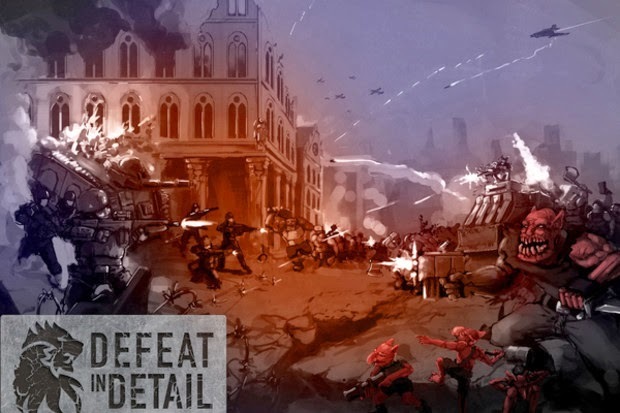 Using them as an engage force to wipe out broken formations was a plan but I realized ahead of time that killing the one remaining Fearless Commissar Unit was always going to be a problem. 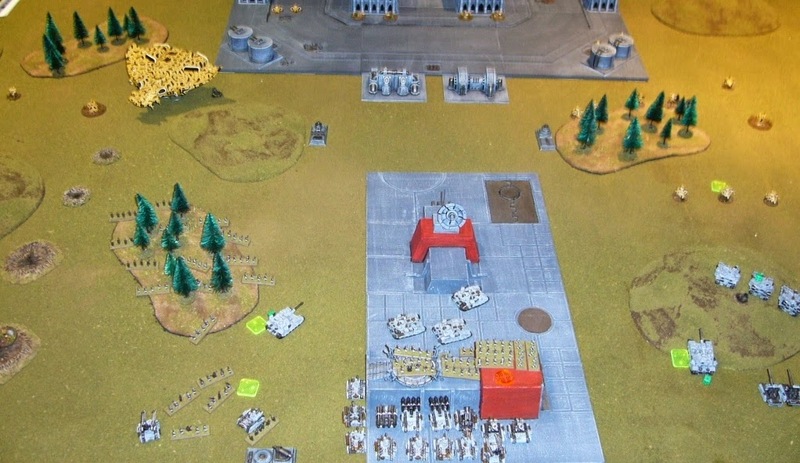 Foolishly I forgot that the Suits moved 20 cm and also missed a trick by not Tau Jump Packing the formation within 15 cm of the available objectives.